Description: CP train #484 heads for Tunnel City behind a new GEVO. Title: CP 8845 at Coakley Siding. Title: CP 8845 at Lobo Siding. 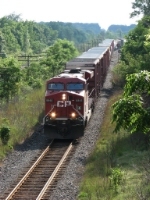 Title: CP 8845 leads 281 across Ontario St.